The US military at Guantánamo Bay prison has released information about hunger striking prisoners being force-fed, acknowledging that the military detention center is partaking in an activity considered by many as a form of torture. 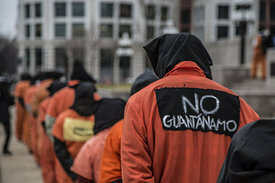 On Jan. 11 2013, members of Witness Against Torture and Amnesty International dressed as Guantánamo detainees and marched from the US Supreme Court to the White House to mark the illegal detention center’s eleventh anniversary. (Photo: Shrieking Tree via Flickr)According to the Associated Press, last week the prison began to notify attorneys representing those prisoners who have been violently and coercively fed. Mukbel, one of 56 Yemeni prisoners being held at the prison despite being cleared for release, described the feeding process as painful. “Crider said Mukbel told her that he had refused to be force-fed on one occasion in March and was taken by guards to the detainee hospital and handcuffed to a bed for 24 hours to undergo the procedure,” AP reports. “Some people have gone through this a lot but he said he had never felt anything like it in his life,” she added. Yousef was the second detainee to have an NG [nasal gastric] tube inserted into his nose and pushed all the way down his throat and into his stomach, a procedure which caused him great pain. Yousef was given no anesthesia or sedative for the procedure; instead, two soldiers restrained him – one holding his chin while the other held him back by his hair, and a medical staff member forcefully inserted the tube in his nose and down his throat. Much blood came out of his nose. Yousef said he could not speak for two days after the procedure; he said he felt like a piece of metal was inside of him. He said he could not sleep because of the severe pain. When Yousef and others “vomited up blood, the soldiers mocked and cursed at them, and taunted them with statements like ‘look what your religion has brought you,'” Tarver wrote. Lawyers representing the hunger striking prisoners say that most of the 166 prisoners being held are participating in the strike which began around February 6. Though the military only acknowledges 42 of those individuals as ‘hunger strikers,’ they reported that, of those, 11 were being force fed, according to detention center spokesman Navy Capt. Robert Durand. In 2006, the United Nations Human Rights Commission concluded that the violent force-feeding of detainees by the US military at its Guantánamo prison camp amounts to torture. And the Declarations of Tokyo and Malta, the World Medical Association, and the American Medical Association prohibit doctors from participating in force-feeding a detainee, provided the detainee is capable of understanding the consequences of refusing food.